Shri Guru Charitra - Chapter 11 - Birth of Shri Narasimha Saraswati!!! An account of a Brahmani has been given in the 8th chapter. She was worshipping Shri Shankar devotedly in the evening on Shani Pradosh (12th day of a fortnight falling on Saturday). She died in course of time and took the next birth in a Brahmin family at Karanja in Berar. Her name was Amba Bhawani. She was married to a Brahmin youth Madhava, who was also a devotee of Shri Shiva. As per her nature of the previous birth Amba Bhavani worshipped Shri Shiva along with her husband devotedly. She became pregnant when she was sixteen years old, customary ceremonies were performed in the 3rd and 5th months. She used to have good desires. She advised people with high principles. Filing of 'oti' (putting of corn, coconut etc. in the open side of the sari worn by a woman) in the 7th month and Simanti was also observed. The parents of the child were very much pleased to heart this and they gave money and clothes to the Brahmins. In order that the baby may not suffer from the evil eye of any person, lemon and salt were waved on him and thrown away. One day Amba told her husband that there was not sufficient milk in her breast for their baby. So let us have a feeding nurse or a sheep Hearing this the baby smiled and just touched the right pap of its mother. Immediately milk sprang out in 32 teats and her clothes became wet. Knowing thus that the baby was an incarnation of god, the parents bowed to him. The mother put the baby in a cradle and sang lullaby songs. But the baby would prefer to lay down on the floor and play cheerfully. The child became on year old; but it did not utter any other words except OM. The parents were anxious to see that the child speaks other words also. As days passed on, they were afraid of his being dumb. Some would say he has all the knowledge, but purposely he does not speak. The child became 7 years old. The parents could not known how to celebrate his thread ceremony. As they were Brahmins, the thread ceremony was most essential. They worshipped Gouri, observed Pradosh and other fasts but they were of no avail. They were now anxious to know how to make the child recite Gayatri Mantra (the mantra in prayer of the Sun god), which a Brahmin boy learns at the time of his thread ceremony. Seeing the parents in dejected mood, the son would approach them and try to console them. Once he held an iron bar in his hand and instantly it was turned into a gold bar. Seeing this the parents were astonished. They gave him some more iron and that too was turned into gold. Then the parents asked the son, when and how he would speak. He moved his hand around his chest and loin and expressed that when the sacred thread would be worn and Nunj grass would be tied around his loin, he would speak. The parents were much pleased and they started enthusiastically the preparations for his thread ceremony, still some doubted the success of the function. The parents invited all the relatives, friends and learned brahmins for the function. The ceremonies started. On the first day 'choul' (shaving the hair on the head) and dinner took place. Next day after the bath of the boy, the sacred thread was put on his left shoulder. The boy dined with his mother and other boys of his age. The father then uttered 'Gayatri Mantra' in the ears of the boy Narhari, who recited it in his mind. The mother then came with alms. 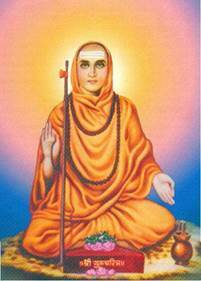 After offering the first alms, the mother asked the boy to recite Rigveda (the first of the four Vedas). Narhari recited 'Agni Meele etc'. After giving the second alms, the mother asked Narhari to recite Yajurveda. Narhari recited ' Yajurveda Ishetwa etc. After the third alms Narhari recited 'Agna Aayahi' from Samaveda, the third veda. Thus people realized that Narhari had the knowledge of all the Vedas and they all bowed to him with reverence. Narhari then said to his mother, 'You have asked me to beg for alms. I would, therefore, live on begging. So allow me to go to visit the holy-places'. Narhare, 'You need not be sorry. You shall have four sons and they will look after you very obediently.' So saying he placed his palm over her head. Mother - 'Dear son, do not go leaving us alone. No religion asks one to be an ascetic in such a tender age. You should have Brahmacharyashram for 12 years. The second is Grihasthashram, the most important in all the four ashramas. After going through the third Ashram viz. Vanprasthashram, one becomes liable for the fourth Ashram viz. Sanyasashram. So say the Shastras. So study Vedas in the Brahmacharyashram. Later on get yourself married and have the pleasures of the family life. Then perform sacrifices and thereafter become a Sanyansi. But it is not desirable to be a Sanyasi in the childhood.